Indiana is a great hub of gaming awesomeness. 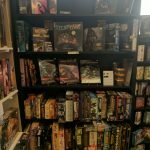 We are bringing in gaming retailers from around the world, we are the host of the Best Four Days in Gaming, more and more games are being developed by Hoosiers, and we have a slew of gaming conventions and shops in towns both large and small. Some of these stores have been around for years, and some have started popping up more recently. In the six years I’ve ran Geeking, I’ve noticed an outstanding trend in many of these new stores: they’re looking to not only cover bills, but also try to build a community. They don’t want arguments over which game is better, they don’t want to exclude, they just want a great place to play games. 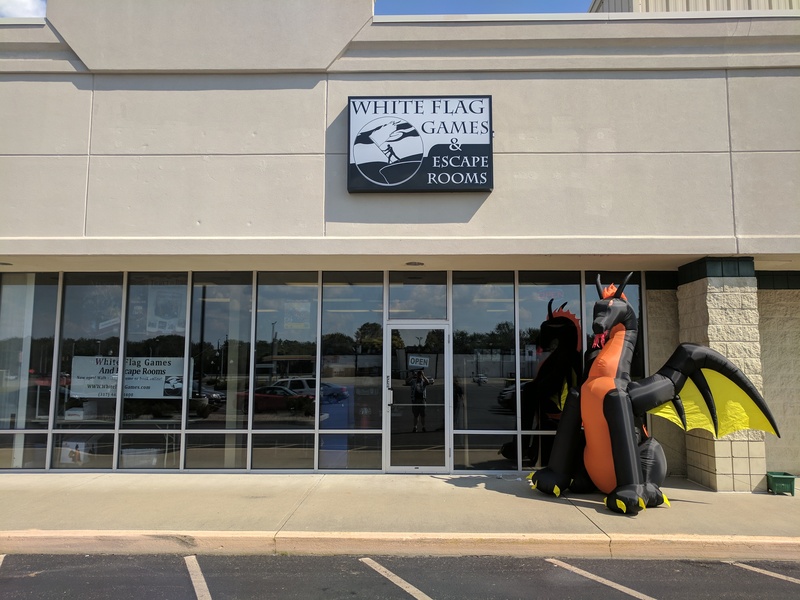 A few years ago, Mooresville received one of these shops, White Flag Games. White Flag Games opened in 2014 as more of an open clubhouse. The owners (Joe, Scott, Nathan, and Chris) noticed their gaming group had outgrown their homes, and were looking for a place to play. 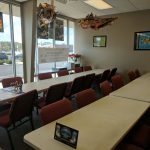 This evolved into a game store, selling games and snacks to keep the doors open, and letting them not only play in comfort with their friends, but also bring in new people, make new friends, and have a good gaming place in town. 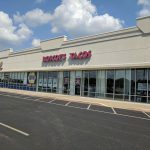 They found a good location, with room for everything they want to do and plenty of parking, and they opened their shop. 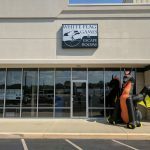 Now, three years later, they have outgrown that old location, found a new one in the neighborhood, and expanded their shop to not only include great gaming space, but also an Escape Room! In the front, White Flag focuses mainly on board games. Sure, they have gamers that come in to play Magic: The Gathering, or Warhammer, but their stock is mainly board and casual games. They do have card game packs and singles at the counter, but everywhere else is board games. Some items Lizz and I were drawn in by this round were the Bill & Ted board game, for example. 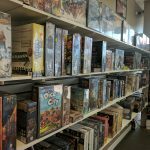 In addition, they also buy and sell used board games, and they have a good selection of those, as well, by the front counter! 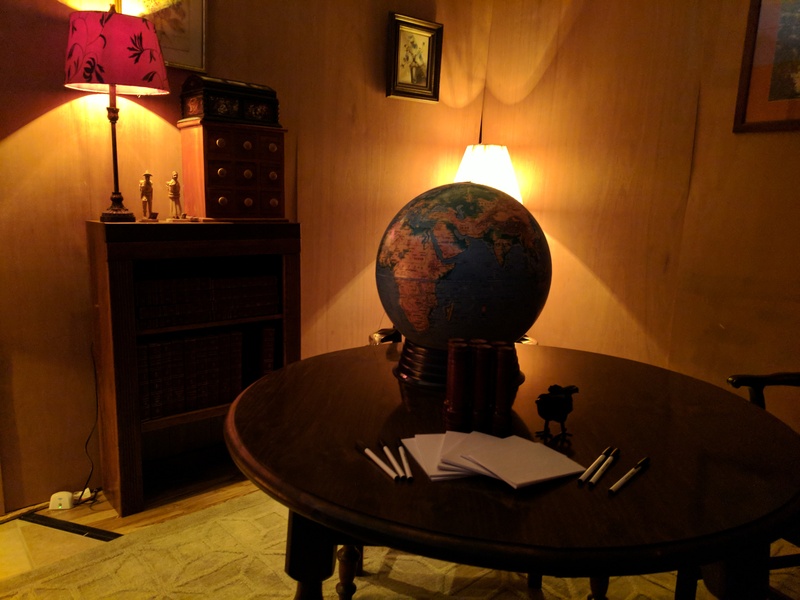 In the back of the store, they have a set-up for an Escape Room. The room’s concept was done in house, and everything was put together by them. They keep the price very affordable, with a charge of $20 per person, or $100 for a party of six people. I was given the opportunity to take one picture (seen to the right) after all clues were carefully removed, the angle approved, and then the final picture approved. We talked about their Escape Room, and it turns out that it is completely modular, so they can adjust it at any time to create more play area (think Magic: The Gathering releases), adjust it with new puzzles, and even take it down and transport it to local conventions. 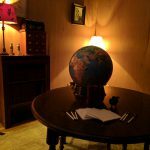 So, local shows take note: if you want an “escape room experience”, reach out to White Flag! While White Flag is a game shop that’s more of a hobby for the owners, all of whom have day jobs, it is still a cool place. It is open, clean, and friendly. 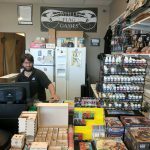 If you’re near Mooresville, and you’re looking for a Friendly Local Game Shop, I can’t recommend this crew enough! They definitely fill the criteria well! What are they? 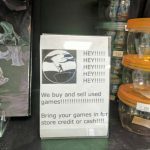 Your friendly local game shop! What is their parking situation? They are located in a strip mall, so there is plenty of parking in the lot around their store. When are they open? They are open Monday from 2:00 PM to 9:00 PM, Tuesday through Thursday from 11:00 AM to 9:00 PM, Friday and Saturday from 11:00 AM to 10:00 PM, and Sunday from 12:00 PM to 6:00 PM. Just kidding on the phone number! Internet! Where are they online? You can find the store’s site here, you can find their Facebook page here, and you can find their Twitter feed here! Smile! You’re going on a blog! 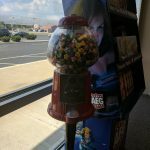 A gumball machine full of dice? Bravo! 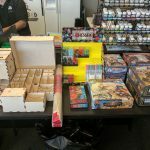 Geeks 1st Boxes and other stuff! They’re by a Roscoe’s Tacos! You can’t go wrong!! !